Only DreamWorks could envisage a commercial future for a film based on Stephen Sondheim’s Broadway classic – Sweeney Todd, the Demon Barber of Fleet Street. But in the end, it took three studios to finance the film, Warner Bros and Paramount having to chip in to cover its $50 million cost. It was a revenge story in which Sweeney, a London barber, murders customers who have wronged him. He and his accomplice Mrs. Lovett then turn their flesh into mincemeat, which is then used to make “the best pies in London.” Not exactly escapist fare. DreamWorks had long shown interest in the project, and with three hits in a row, who could deny Burton? 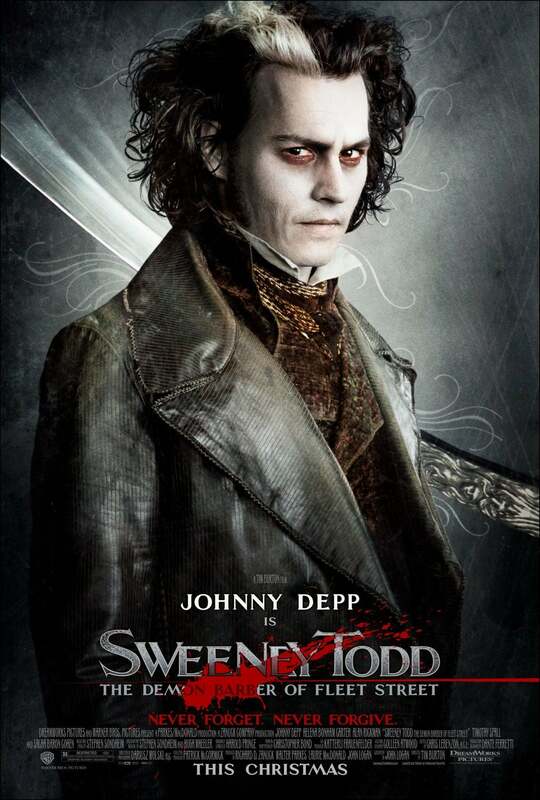 And then when Johnny Depp, at the time Hollywood’s most bankable star, was eager to play Sweeney, the film started shooting at Shepperton Studios in London. Burton’s then partner and mother of his children Helena Bonham Carter was signed to play Mrs. Lovett, a role immortalized by Angela Lansbury on stage. The all-star British supporting cast included Sacha Baron Cohen, Alan Rickman, and Timothy Spall. The film received favorable reviews when it opened, but to no one’s surprise, it wasn’t embraced by American audiences, grossing only $52 million. It did twice as well overseas. Surprisingly it was Sam Mendes who first suggested making the film. He was the one who hired John Logan to write the screenplay, and only after he became distracted by another film Jarhead, was Burton given the job. Essentially it was a faithful translation to the screen. No concessions to pop culture were made, and Burton was given free reign to spark his imagination. Some liberties, however, were taken with the score, but all with Sondheim’s approval. The famous opening “Ballad of Sweeney Todd” was dropped, and others were shortened, “If you go along with it, I think you’ll have a spectacular time,” Sondheim later told the HFPA. All the actors, particularly Depp, did the score proud. The film won Golden Globes for Best Musical or Comedy, Best Actor (Depp) and both Burton and Bonham Carter were nominated.